Hungarian art critic and writer; born at Budapest July 1, 1845; died there Jan. 12, 1899. After graduating from the gymnasium of his native city he studied philosophy and medicine at the University of Leipsic, comparative philology at Berlin, and history and political economy at Heidelberg (Ph.D. Leipsic, 1866). He then devoted himself to journalism, and contributed to the "Leipziger Tagblatt," the "Deutsche Allgemeine Zeitung," and the "Fremdenblatt," also editing the weekly "Dramaturgische Blätter" in collaboration with Strakosch and Taube. Returning to Hungary in 1870, he became editor of the "Temesvarer Zeitung"; seven years later he went to Budapest, where he contributed to the "Pester Lloyd" and to the "Neue Pester Journal." 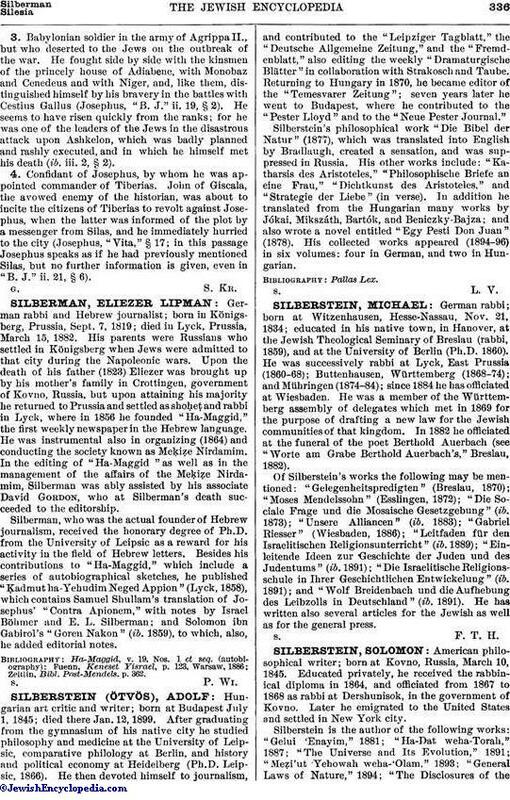 Silberstein's philosophical work "Die Bibel der Natur" (1877), which was translated into English by Bradlaugh, created a sensation, and was suppressed in Russia. His other works include: "Katharsis des Aristoteles," "Philosophische Briefe an cine Frau," "Dichtkunst des Aristoteles," and "Strategie der Liebe" (in verse). In addition he translated from the Hungarian many works by Jókai, Mikszáth, Bartók, and Beniczky-Bajza; and also wrote a novel entitled "Egy Pesti Don Juan" (1878). His collected works appeared (1894-96) in six volumes: four in German, and two in Hungarian.